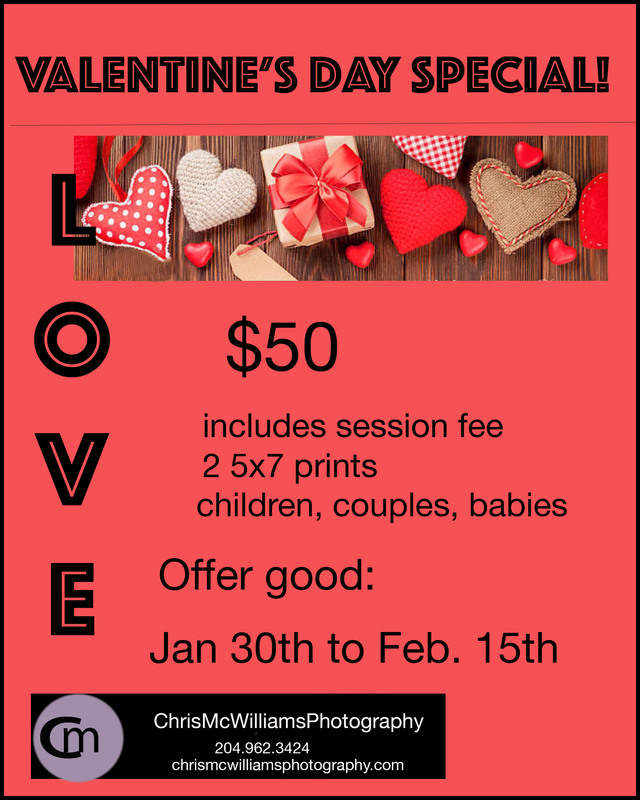 If you’ve been waiting to get a portrait of your child or of you and your honey, this is the special that you’ve been waiting for! For only $50 you will receive a 45 minute session, plus 2 5×7 prints, including low resolution digital images of those prints. This is available for a limited time only, so don’t delay. The regular price of a session is $80 and the 2 5x7s are another $80; so this is a savings of $110!! I guarantee that you will love your pictures and that we will have fun doing the session. Don’t delay. Call or text me today at 204.962.3424. This young lady was part of a family session that I did last week at St. Vital Park. I couldn’t resist featuring her images in this post. Having photographed her I know that if she didn’t pursue a career in social work that she could be a model. Here’s sneak peek from this session. Last night was the prefect evening for grad portraits and this young lady was the perfect subject. Sarah looked like a very beautiful princess and made my job easy. The interesting connection with Sarah and her mom was that I had done pictures of the Christmas concerts at Maple Leaf School and they remembered that and looked me up. That was a few short years ago!! The young man pictured below contacted me a couple of weeks ago to ask if I would photograph him asking his girlfriend to get married. So we made a plan for how we would manage this; the timing, the posing, the movements. Everything worked out very well; he got down on his knees and gave her the ring and she said “Yes.” He had managed to keep everything a secret and his girlfriend was very surprised. It was a touching moment that left me with tears in my eyes. It was so much fun to photograph this couple and see how much they love each other. This is before the proposal. No ring! Do you need a real estate agent? I would recommend this lovely lady, who I did head shots for in the Exchange district. Nannette was a real trooper enduring some cool temperatures to get the look that she wanted. I had a great time getting to know Nannette and taking her pictures. I had a great time doing a session with this mom and her two gorgeous daughters. I love working with children, but adults are usually a breath of fresh air because of how much easier they are to work with and this session was totally amazing! I was at a fantastic seminar on the weekend where the presenter, Marlene Fast, made us think about where our Happy Place was in photography. Well, I was in that Happy Place tonight with this wonderful couple and their fun doggie. This little guy is a bundle of energy at 8 months of age and as cute as can be. Kildonan Park was a perfect location for this fall photography session (except for a few mosquitoes). The light was perfect; the couple was fun and the dog was cute. As I said; My Happy Place.